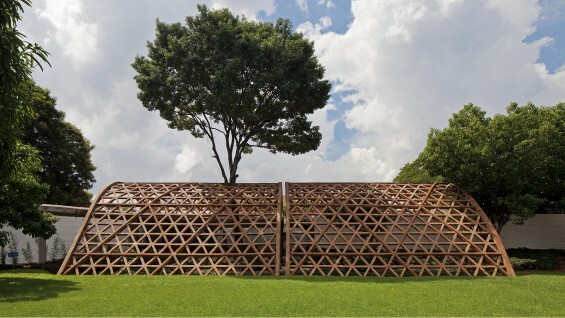 At the 15th International Architecture Exhibition of the Venice Biennial in 2016, Gabinete de Arquitectura exhibited a soaring parabolic canopy pavilion constructed from Paraguayan brick. The firm won a Golden Lion award and was cited by the jury for using “simple materials, structural integrity and unskilled labor to bring architecture to underserved communities.” Other recent projects include the Teletón Children’s Rehabilitation Center, which was constructed entirely from recycled materials, in Lambaré, Paraguay, and the Unilever building and campus in Asunción. The firm designed several residences in Paraguay including the Esmeraldina House in Asunción, the Las Anitas House in Santani, and the House in Itauguá. Gabinete de Arquitectura was a finalist for the 2nd Mies van der Rohe Award for Latin American Architecture in 1999 and received a Work of the Decade award from the Paraguayan College of Architects. The firm also participated in the 10th Ibero-American Biennial of Architecture and Urbanism in São Paulo. Solano Benítez graduated from the School of Architecture at the National University of Asunción. In 1999 he received an Outstanding Youth award from the Junior Chamber of Paraguay for his contributions to national culture. He received the BSI Swiss Architecture Award in 2008 and the Architect of the Bicentenary award of the Paraguayan Architects Association in 2011. Benítez was given an honorary membership to the American Institute of Architects in 2012. He has taught at the Catholic University of Santiago in Chile, the Universidad Politécnica (ETSAM) in Madrid, Spain, and the University of California, Berkeley among other institutions. Gloria Cabral graduated from the National University of Asunción where she has taught since 2009. She was selected to participate in the 2014-2015 Rolex Mentor & Protégé Arts Initiative, which offered her the opportunity to work alongside architect Peter Zumthor in his Swiss studio.